A Tokyo shopping street smelling of sandalwood. Ume and Kiku flowers embroidered on silk kimonos. A one-man band of bells, drums and other music-makers entertaining children. Rotting hulks of ships in a Philippine harbor turning its water brown. The texture and temperature of air in each place. For many years, her adult life focused on family and work, but she was able to take advantage of sporadic opportunities to indulge her artistic appetite. She studied art as the lessons presented themselves. While in Texas, a friend taught her Tole painting. An artist in Arizona instructed her on how to stretch the limits of one color in a series of monochromatic still life paintings on canvas. But art classes were put mostly on hold while she cared for her small children, studied for a bachelor’s degree in American Studies (1972), and acquired a masters in Organizations and Organizational Behavior. By the time she completed her master’s studies, Judy was living in Washington DC and had a job as director of admission for the dental school at Georgetown University. Subsequently she spent ten years as a graphic designer developing the technical processes of editing images and forming design effective layouts. In addition to numerous university catalogs, she worked on a particularly intriguing book for a United Nations Landmine Symposium. “No matter where I am or what I am looking at, color grabs me,” Judy reflects. Some of her paintings start with a fresh white canvas and a limited palette of colors. Others make use of salvaged old paintings. She ponders as she works on her current series, “How can I push this, make it more playful or funky?” As with the French Fauve painters of the early 1900’s, the answers are found in juxtaposing high intensity colors with abstracted floral motifs--subtracting out some things and focusing on what remains. Judy, like Matisse and others, separates color from its descriptive, representational purpose, thus allowing it to exist on the canvas as an independent element. Color projects a mood and establishes a structure on the canvas without having to be true to the three dimensional natural world. 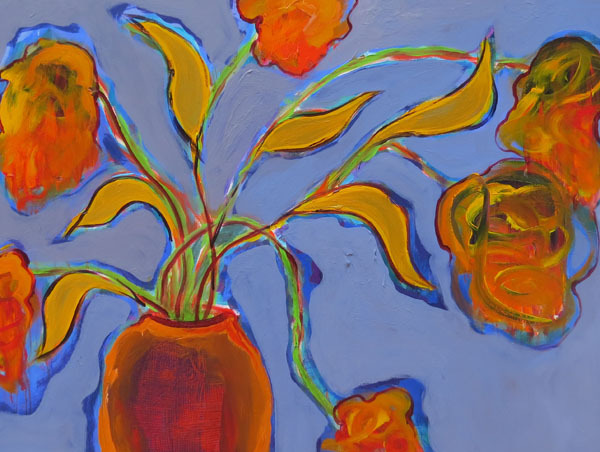 Judy’s current work is an emotional response to flowers, a unique intuitive expression. Tutto sui Fiori, Touchstone Gallery, 901 New York Ave NW, Washington DC. August 31, October 2,2016. Opening: Friday, September 9, 6-8:30 pm. Artist Talk: Sunday, September 25, 2pm. Wed-Fri 11-6 and Sat-Sun 12-5. info@touchstonegallery.com 202-347-2787.